In the information technology industry today, information is our primary asset. Information is what we provide to the business. Information is also pivotal for the success of the IT organization in providing valuable services to the business. Knowledge management – when done right – can be integrated into the organization and enhance the performance of both the IT service provider and the business. However, organizations need to begin to see knowledge management as a strategy and not as something that is done in addition to service management. Knowledge is the key to making the right decisions on how to guide the organization and drive a competitive edge. Knowledge management is a shared strategy between the business and employees, and the IT service provider and users. Knowledge management is a process that helps the organization to manage intangible assets by combining knowledge with the experience of individuals or knowledge workers (Ioniţă and Ioniţă, 2011). A knowledge worker is an organizational asset who possesses the relevant knowledge in the form of experience, expertise and problem solving abilities in a domain of knowledge with the ability to understand problems and develop solutions to those problems (Laha, 2011). In the IT support organization; a knowledge management process seems almost secondary to the restoration of services. Yet, knowledge is key to making incident management and problem management successful. The knowledge worker, or support analyst, is only as good and the knowledge and experience that they apply to resolving customer issues. How can knowledge drive a competitive edge for the business? Knowledge helps the organization to utilize resources more efficiently – leveraging those resources smarter and more productively in support of the business goals. Knowledge is also important to identify new ways to provide services, create value, improve performance and help the organization to achieve the goals and objectives (Anand and Singh, 2011). All of these high level achievements of knowledge management are driven through IT systems. The IT service provider, through enabling knowledge utilization in the business process, can help to drive innovation and rapid adaptation. A successful knowledge management strategy must address four key areas: knowledge management strategy as a core focus and competency; flexible structure for knowledge creation and dissemination; technology and processes; and skilled knowledgeable workers (Neto, Souza, Neves, & Barbosa, 2008). For the IT service provider, knowledge as a strategic focus is key to survival. “Lack of practices of protection and sharing of information and knowledge, leading the organization to a constant reinvention of the wheel and continuous duplication of efforts Problems with data/information collection, treatment, organization and dissemination, indicating lack of strategic information management; Recognition that both information and knowledge are the main factors of competitiveness in modern times; Need for the creation of an organizational space for knowledge, also known as ‘Ba’ or “enabling conditions”, vis-a-vis the need to address cultural and behavioral issues” (Neto, Souza, Neves, & Barbosa, 2008, p. 254). Knowledge management combined with IT service management help to develop a focus that enables both the organization and the IT service provider to work together to overcome these barriers. As technology changes, however, the need for a clear and definitive knowledge management is increasing. The increase in adoption of mobile devices, cloud computing, and virtual workplace only makes knowledge management more important. Our customers are bypassing the IT support organization and driving decision making through Google, the user’s preferred source of knowledge. This rapid change requires the IT service provider to change and adapt – now more than ever. These key developments are driving the need for a knowledge management strategy. Global adoption of mobile devices has tripled the amount of data streaming over networks in the past three years. Knowledge workers depend upon these devices to be connected to the corporate infrastructure when work requires a mobile workforce. Many more corporations are moving towards leveraging these devices as a corporate strategy to save costs and increase productivity. But are corporations also defining strategy for the knowledge that is captured, structured and used on these mobile devices? Data security is a focus – where corporations decide what to do if the mobile device is lost – in order to protect the knowledge from inappropriate use. However that strategy should also enable mobile knowledge management in addition to mobile knowledge acquisition – where the corporation leverages the knowledge on these mobile devices to drive better decision making at the corporate level. A virtual workplace also provides significant challenge in a corporate knowledge management strategy. Here, employees must exercise personal knowledge management and the ability to identify relevant knowledge that will enable the virtual worker to stay competitive in an ever-changing landscape. In addition to capturing knowledge that can be used at the corporate level, employees also must stay up-to-date on the skills that are necessary to complete their roles and responsibilities in the organization. This requires more ownership on the part of the employee to understand what is needed, how to gain that knowledge and understanding, and how to enable the use of knowledge at the corporate level through the use of communication and knowledge management systems. The information and data that is captured within an organization provides an excellent picture of the customer experience. To leverage this information to support changes in products or services requires the organization to develop an overall strategy for what information to capture and the required processes to use that information to support decision making. The strategy also must address the processes that interact with the customer – defining a customer experience that not only captures the right information but empowers the knowledge workers that interact with customers to own that experience to a successful resolution. In a multiple-channel environment, the complexity of managing the customer experience intensifies – requiring even more control and management of each customer experience. The only way to successfully manage the complexity is through knowledge. When an organization tracks the entire customer experience, the knowledge provides a comprehensive view of what services the customer uses, how stable those services are in delivering customer outcomes, and improvement opportunities that ensure retention of the customer and improved management and enhancement of services. It is rare today to find a user who is not aware of Google and the data and information that lays only a few clicks away. Faced with this ever-growing repository of knowledge, organizations struggle to provide the right solution to customers faster than they can find it on the Internet. A few aspects of the Google-effect can leave organizations vulnerable. First is the information that customers find credible? The source of information found on the Internet must be carefully evaluated by the user to ensure that it can support decision-making. Is the content written in terms that the user can understand? The information must help the user and not cause more issues that need to be resolved. Dissemination of corporate knowledge is slow and often does not meet the needs of the user population. It is important for corporations to develop a knowledge management strategy that responds to user needs in a timely and efficient manner – that takes information and data real time and provides that information and data in the right context from a trusted source – the corporation. The ultimate goal is to encourage users to utilize corporate knowledge as the trusted source but also to provide real-time information that is relevant to supporting decision-making. Cloud computing is defined as when the IT service provider uses infrastructure resources or services over the Internet. When an organization develops a strategy for leveraging the cloud, it also should consider how knowledge is captured and leveraged through the end-to-end service delivery. Often the cloud can provide new tools for knowledge acquisition and dissemination. This can lead to an increased level of performance of the company through data mining across multiple data sets (Ioniţă & Ioniţă, 2001). An example of this can be found at Brazilian National Cancer Institute, where a knowledge management system was implemented leveraging Web 2.0 technologies that enables increased speed of cancer diagnosis, enhanced quality of diagnosis, minimized costs, improved management performance, and an increase in knowledge retention. All of these are business outcomes that are made possible through the use of a solid knowledge management strategy that leverages the cloud (Ioniţă & Ioniţă, 2001). Clearly the cloud is enabling the organization to be more agile, and in many cases more cost effective. However, the knowledge assets that are stored in the cloud must be used by the corporation to support decision-making. Virtualizing this type of data requires strong processes that use the technology to encourage both the organization and the IT service provider to capture, maintain, and utilize these knowledge assets. 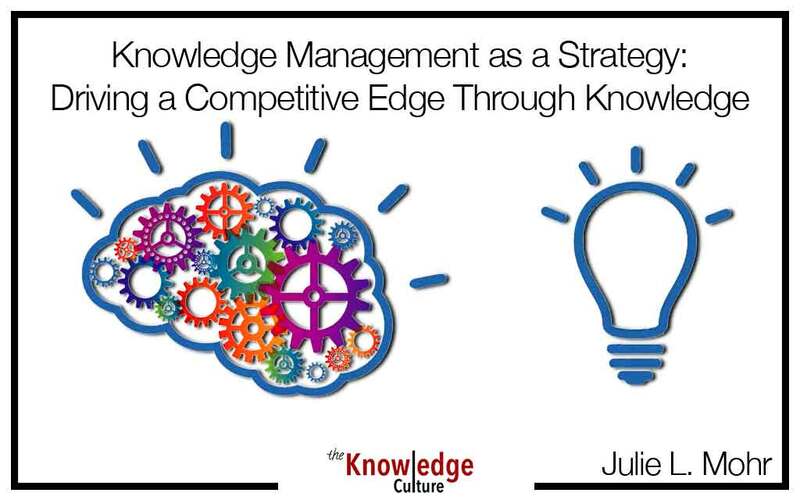 The success of any knowledge management strategy is likely to hinge on the corporate culture and the ability to establish an appropriate strategy and carry out that strategy throughout the organization. To drive success the organization must develop a culture that encourages self-motivation, sharing knowledge, using knowledge to drive creativity and innovation, and developing knowledge sharing networks both internal and external to the organization (Toloie-Eshlaghy and Akbari-Yusefvand, 2011). IT Service Management and knowledge management are two critical parts of an IT service provider’s strategy that will drive these benefits with the organization. The organization cannot be successful unless the IT service provider develops the appropriate processes and strategy to support the use of knowledge throughout the organization. Imagine an organization that has a successful knowledge management strategy. The IT service provider provides value to the business through reduced innovation cycle times and faster to market solutions. This leads to increased market share and a more expansive service portfolio. The organization can make better decisions on how to use the expertise of knowledge workers and increase the learning capacity of the organization. Ultimately this enables the organization to anticipate competitors’ actions and movements (Neto, Souza, Neves, & Barbosa, 2008). If corporations do not develop a knowledge management strategy now, the information age will continue to evolve and bypass the corporation. Some will argue that it is already too late to bridge the knowledge gap, but through the use of the right resources, culture and available technologies – a success knowledge management strategy is possible – and when combined with a IT Service Management strategy, value is finally attainable. This article was originally published in Support World – Edição 3, 21 Novembro 2011. Julie speaks at conferences worldwide on topics of leadership, business, knowledge management, customer experience management, service management, governance, organization development, process engineering, service level management, and continual improvement. Anand, A. and Singh, M. D. (2011). Understanding knowledge management: A literature review. International Journal of Engineering Science and Technology, 3(2), 926–939. Kovacevic, D., & Djurickovic, T. (2011). Knowledge management as critical issue for successful performance in digital environment. International Journal Of Management Cases, 13(3), 181–189. Ioniţă, I. and Ioniţă, L. (2001). An overview of cloud computing and knowledge management. Buletin Stiintific, 1(31), 25–30. Laha, A. (2011). On challenges and opportunities of designing integrated IT platforms for supporting knowledge works in organizations. Vikalpa: The Journal for Decision Makers, 36(3), 21–46. Neto, R. C., Souza, R. R., Neves, J. T., and Barbosa, R. R. (2008). Strategic knowledge management: In search of a knowledge-based organizational model. Comportamento Organizacional E Gestão, 14(2), 247–256. Toloie- Eshlaghy, A., & Akbari-Yusefvand, A. (2011). Identifying and prioritizing critical success factors (CSFs) in practicing knowledge management in small and medium firms using decision making techniques. European Journal Of Economics, Finance & Administrative Sciences, (40), 101–116.